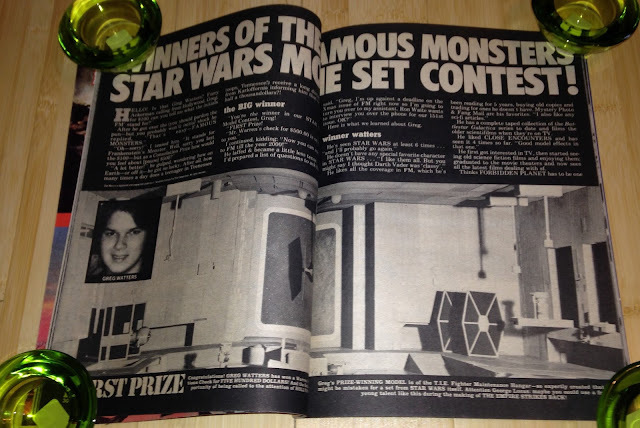 Back in January I published a post on the topic of Star Wars dioramas that were featured in a 1979 issue of Famous Monsters magazine. You can read that post here. The dioramas are of interest to contemporary action figure collectors because they feature a lot of products released by Kenner toys. They also offer an intriguing peak into the then nascent customizing hobby. This post focuses on the remainder of the photographic prints found in the archives of Famous Monsters editor Forrest J. Ackerman. Collector Yehuda Kleinman owns this lot, and he was kind enough to allow us to share them. First up is a rather large diorama representing a shoot-out between our heroes and some Stormtroopers who are trying to escape from the rooftop solarium of Le Corbusier's Villa Savoye. If you look closely you'll see that the legs of some of the figures have been bent in order to effect action poses. Also, the Death Squad Commander, a new figure at the time, makes an appearance in the likeness of one of the white-helmeted Rebel troops from the opening scene of Star Wars. Because the helmet of the DSC is so similar to that worn by those Rebel troops, customizers have long enjoyed making the figure turn traitor and fight on the side of the Rebellion. In fact, evidence exists which suggests the folks at Kenner had a very similar idea. The vehicles are a combination of built-up MPC model kits and stickers or decals. Here's another angle of the diorama, this one more clearly showing the figures' bent knees. This submission was created by Camilo Vargas of the Bronx. It took third prize in the contest, good for $150 worth of Don Post masks. It must have been a heckuva Halloween for Camilo! Chris Jimmerson of Salem, Oregon, created this representation of Luke, Han, and the droids hosting an episode of Hoarders. The back of the print includes text noting Chris' name (misspelled), the scale at which it was to be reproduced for publication, and the page on which it was to appear in the magazine. If you look closely at the front of the print you'll see several orange markings. These indicate where the image was to be cropped when being reproduced. This entry has Luke, Chewbacca, and the droids lost amid terrain that seems more akin to Indiana Jones than Star Wars. The skull is a nice detail. The reverse reveals that it was created by Jody Price of Anderson, Indiana. Another angle. The scenery elements are of a kind that was commonly available in shops catering to model railroad hobbiests. Remember those places? I loved 'em. The mom-and-pop hobby shop is now all but extinct. This shot clearly shows this diorama's weirdest element: those uncanny mono-toned figures to which our heroes seem to be reacting. Are they statues? Hoojibs? And why do they appear to be engaging in what might be described as adult activities? Whatever they are, they helped Jody tie for sixth in the contest, good for a three-year subscription to FM. This scratch-built TIE Fighter hangar is the work of Greg Watters of Tennessee. It's probably not as interesting to today's collector as some of the other work featured in this post, as it makes use of no Kenner products. But that lack of reliance on pre-existing material probably helped Greg win the contest: This model took first prize, good for $500, or close to one million in 1970s money. Here's a clearer shot of Greg's TIE Fighter. A lot of fine detail work went into the building of this model. It's easy to understand why the folks at FM chose it as their top entry. That vehicle you see in the upper left corner appears to represent a novel brand of TIE Fighter -- one with rectangular side panels and a round, projecting cockpit. This image of Greg's model appeared, slightly cropped, on page 32 of the magazine. I love the explanatory label affixed to the base of the piece. It's made of that plastic tape that Bart Simpson used to mark all his possessions before Timmy O'Toole fell down the well and had to be rescued by Sting. HOMER: That Timmy is a real hero. LISA: How do you mean, dad? HOMER: Oh, well, he fell down a well. And can't get out. LISA: How does that make him a hero? HOMER: Well, it's more than you did! If you listen to the SWCA podcast (and of course you do! ), this next diorama may be familiar to you: It was discussed by Yehuda, Skye, and Steve on Episode 71. Skye actually succeeded in contacting its creator, Robert Wyer of Hoffman Estates, Illinois. Robert remembered the diorama -- and the contest -- quite well. Give the episode a listen to learn more. If you note the placement of the orange marks on the above photo you'll understand that much of Robert's diorama was cropped out of the photo that appeared in FM: Only the vignette of Luke, Leia, and the droids was visible in the pages of the magazine. But it wasn't a total loss: That Luke, with its custom-made soft-goods boots and clothing, represents one of the cooler figure alterations visible among the contest entries. Robert's diorama tied for sixth prize. Here's the third-prize winner, the product of Keith Weir of Southgate, Michigan. 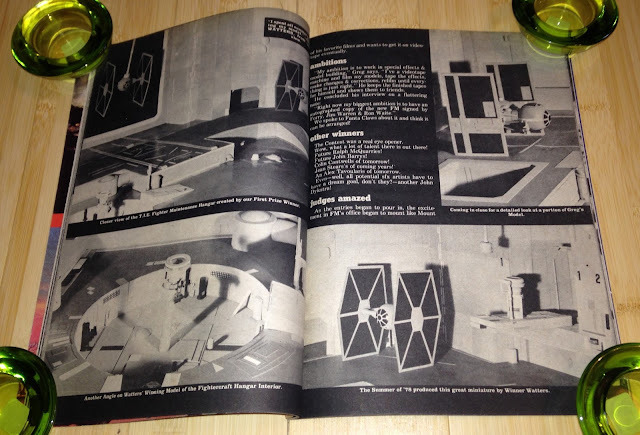 Like Greg's TIE Fighter Hangar, it makes use of no Kenner elements: Those figures appear to be built from scratch. The tropical setting is pretty novel. It almost looks like it could be connected to Jody's skull-in-the-jungle diorama. This low angle really emphasizes the dynamic quality of the piece. Of all the dioramas we've considered, this one does the best job of conveying action. I discussed this piece, by Edward Schiess of Tampa, Florida, in the previous post regarding this contest. This is the image that was reproduced in FM. I also discussed this model in the previous post, noting that I had no idea who made it or what it represents. This photo provides a partial answer: It's a set for the then in-production Star Wars sequel! The text "Star Wars II, Lot 5, Set 5" is scrawled on the cardboard that comprises the back of the piece. This is the contest's sole avant-garde entry. It didn't win a prize. Too ahead of its time. My favorite of all the dioramas of which Yehuda has photos is this one, a sixth-prize winner by Jay C. Nolan of Columbia, Maryland. Yes, that's a Darth Vader figure standing in that odd ruin. But what is the Creature from the Black Lagoon doing there? I mean, Vader is pretty monstrous and all, but I never saw him as the kind of guy who consorted with actual monsters. At first I thought the Creature derived from the Remco four-inch action figure, but it seems much too large for that to be the case. Here you can see his head poking above the lintel of the structure's doorway. It's intended to represent some kind of statue. In this shot, the one selected for reproduction, you can clearly see that Kenner's Luke and Leia figures are being menaced by Vader. So what does this diorama represent? At first I didn't let this bother me too much. After all, several of the dioramas -- the jungle-set ones in particular -- seem to derive from nothing but their creators' imaginations. But this particular piece seems so specific -- especially that statue. The answer was suggested by the figures. Splinter of the Mind's Eye, the first "expanded universe" novel connected to Star Wars, was released around the time of this contest. It was written by Alan Dean Foster, and was intended to serve as the basis of a possible low-budget sequel to Star Wars, a movie many thought would achieve only middling success. 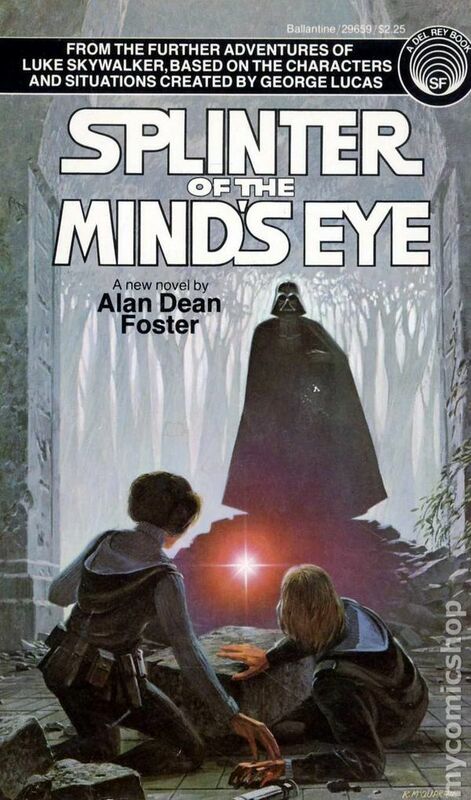 Now, like most people who don't have kids named after Star Wars characters, I have never read Splinter of the Mind's Eye. But the poses of the figures reminded me of the novel's cover -- which, by the way, was painted by some guy named McQuarrie. So I did some Googling, dipping my toe into the waters of the vast nerdlinger sea, and I'm now certain that this diorama represents the climax of the novel. 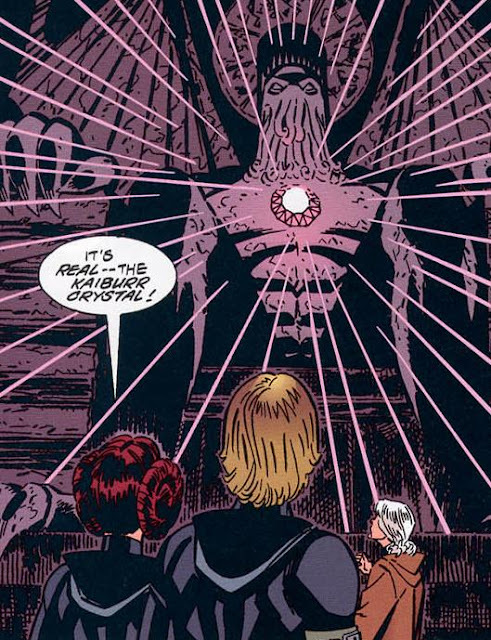 According to Wookieepedia, that climax featured "an enormous statue of Pomojema, imbedded in which was the Kaiburr crystal." Honestly, I don't know a Pomojema from a Maz Piñata. But I feel pretty sure that the spherical object you see the Creature Pomojema holding in the above photo is intended to represent the Kaiburr crystal. Oh, and that hole in the center of the diorama is the well into which Wookieepedia claims Vader falls at the end of the story, thereby allowing Luke and Leia to escape and engage in further quasi-incestuous adventures. STING: This isn't about show business, it's about some kid down a hole or something, and we've all got to do what we can. Here's another artist's rendition of the Pomojema statue, presumably drawn from a comic-book adaptation of Splinter. The Creature must have refused to sign onto the project, thereby forcing the book's producers to summon Cthulhu from his death-like sleep in the sunken city of R'lyeh. Either Brando was unavailable or the book's producers decided Cthulhu was easier to work with. This two-page spread from FM includes photos of Robert, Jody, Edward, and Chris along with reproductions of some of the photos discussed in this post. 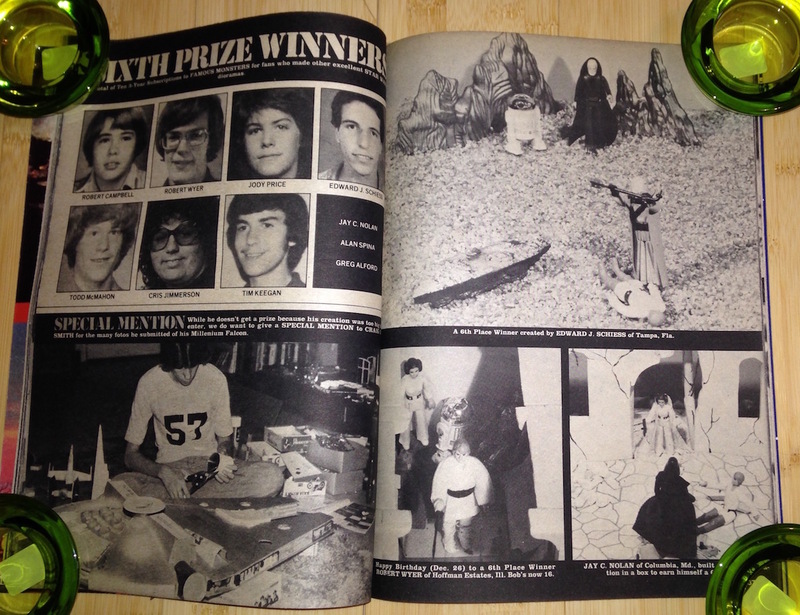 Greg's first-prize diorama was featured across four pages. Greg dreamed of working on movie effects. FM was notable for the attention its writers paid to behind-the-scenes movie talent, SPFX maestros in particular. Unfortunately, the pages featuring Jody's and Chris' work fail to explain what the dioramas represent. Maybe they represent scenes from the Marvel comics? If you have any ideas, post 'em in the comments. Wow! In your last post I asked if there was any Splinter diorama evidence and there it is. You should read the book if you're waiting for paint to dry one night.